The relatively recent phenomenon of the payday loan has caused much heartache and suffering for millions of hard-working people in the UK. The problem has grown over time because of the banking crisis and the consequential downturn in the economy. Faced with the prospect of balancing their books, traditional banks and financial institutions have been forced to tighten up their lending guidelines – leaving millions of people without access to credit for emergencies. Payday loan providers apply exorbitant rates of interest to their cash advances. If people can pay their loan off on time, such a service can be cheaper than an unauthorised overdraft. The problems start, however, when people are forced to defer repayment, or when they simply don’t have the cash available. Initially modest amounts can quickly snowball out of control, leaving people with debt mountains they have little or no chance of repaying. Some people decide to tackle debt problems on their own, and sometimes with great success. However, that is not always the case, and there are four very pertinent reasons why dealing with payday loan debt yourself could end in heartache. Most people are not in possession of all the legal facts when they decide to take creditors on without expert help. There are some unscrupulous lenders who take advantage of this fact to pull the wool over the eyes of unsuspecting consumers. However, a debt help specialists will have a thorough and detailed knowledge of the law, and that knowledge will be used to protect your interests. For most people, the prospect of mounting a legal challenge or negotiating improved repayment terms is simply too much to cope with. Living with debt can put a strain on almost every facet of your life, and adding to your woes by fighting your case alone can hinder your ability to make a reasoned case – jeopardising your chances of a favourable outcome. Thankfully, debt help advisers have experience in dealing with creditors and the legal framework that governs debt management. This know-how can be used to provide support and peace of mind at a very stressful point in your life. Dealing with creditors yourself puts you at the mercy of other unscrupulous lenders. Applying for debt consolidation loans or accepting new repayment schedules may seem like a good idea at the time, but they will often increase your total debt burden – making the prospect of a debt-free life seem more distant than ever. In the event that your case ends in court, you need to be sure that the entire weight of the law is being utilised to give you the best chance of a positive result. Professional help with debt does not just involve practical advice and expert negotiation skills (although they are vitally important), it usually includes advice from some of the best legal minds in the field of consumer debt law. This type of legal advice and guidance would cost you a small fortune if you were to turn to a solicitor for help. If you’re concerned that turning to a debt specialist for help with your payday loans is a sign of failure, don’t be! Asking for help is a sensible and practical step towards securing a better future for you and your family. This is an eye-opener post. I haven’t tried payday loan debt and I don’t think I would want to try. And I would rather consult some experts if ever I’d have problem dealing with my debts rather than solving it myself. A professional help is still much better. I never took a Payday loan either! It is a cash advance for a very short time and you pay a fee for it. On annualized basis the interest rate is ridiculous. Many of their customers are the most desperate and least credit worthy people. Hence, they could use professional help. Odd story, but semi-related. We recently got a new phone, and a new phone number. It apparently belonged to someone who never paid their bills, and creditors were calling all day long. It would be such a hassle to deal with, and I can see why it is so stressful. That could be the ultimate nightmare! Collection calls and their not even yours. I can’t think of a much worse financial decision than to take on a payday loan. It is certainly nice to see some resources for getting rid of them for people that are struggling with it. Most people who have to make this choice typically do not have other choices. If they just had some savings , they could avoid this bad choice. I relied on pay day loans for a year and I shudder to think how much it cost me over that time. I got into the unfortunate cycle of taking out a payday loan every pay period so I can pay all my debts. I was literally borrowing $200 or $300 every two weeks at a cost of $30 or $40 a pop. I borrowed once and just never had the money to cover the loan and still pay all my bills. It was horrible. Thanks for writing this article – it’s important for people to know about these things. It seems easy in to get into that cycle! I am glad you are no longer in that routine. I pass by a payday loans office at least once a week and I always want to shout “don’t go in there” or “think twice before you do that” when I see someone walk in. I know how you feel! I look at it from a financial point of view and think the profit margin must be over the top, but I draw the line at this type of business. Payday loans are just horrible but so many people live off of them. And the interest rates are sky high. I don’t understand the how’s or why’s people use this service. It just seems like a never ending cycle. You get them to pay things on time but then now you owe them and still need to catch up so you borrow from them again. Didn’t even know they had collection services. The people who use these services feel they have no choice. Because of how dangerous Payday loans are, you really need to have full understanding of what the implications of non-payment are. Unfortunately I think people who resort to them are desperate and probably not thinking long-term when taking out a Payday loan. I hope that people who find themselves getting “snowballed” as you said are able to find professional help. People who use payday loans need to change their spending habits. A little counseling would go a long way to help people get out of these situations. I’ve heard many horror stories of bad debt consolidation companies out there that are actually shams. How careful do you actually need to be when consulting help for debt consolidation? I am careful with everything I do. Ask a lot of questions, ask for referrals and check them out with the BBB. It would be best to just not get a payday loan in the first place. I’ve taken out a payday loan once. It was about 15 years ago and I paid it off the week after I got it so it wasn’t a big deal. If you let them build up they can get out of control fast though. I get it, payday loans are a slippery slope. It would be best if everyone had savings or some alternative. Unfortunately, people who take payday loans feel they have no choice. 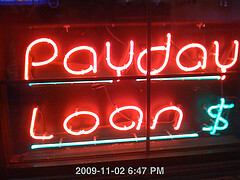 I have never used a payday loan company but I have heard that they are specially destructive. Their interest rates are insane and they can lead to a vicious cycle of debt for sure. Thanks for the helpful info. Much of the high interest is a fee charged upfront! It can turn into a vicious cycle and there is professional help available. Pay day loans should pretty much be a last resort. It’s incredibly hard to get out of the cycle of using them if you are already so deep in debt that you need them because they carry huge interest rates. It’s best to take out almost any other type of loan to avoid the payday variety if at all possible. I think most people who take payday loans feel they have no choice. The only way is to change their spending to have a little savings. That is a good reason to get professional help. Follow These Simple StepsNothing is going to interest. contact their creditors and will be able to get out of debt relief. If it is found to be inappropriate and in violation of the law. I think that if you CAN deal with it yourself, you should. You got yourself into the debt and you should get yourself out if possible. But like any situation with debt, if you can’t possibly repay it, there can definitely be serious problems that you may need to call in the big dogs for. Typically, people who get into trouble with debt are not very good dealing with it. They probably should get professional help.